Pixazza, a Google-backed photo tagging service that has been compared to an “AdSense for Images,” is expanding its service beyond entertainment websites to now include home, travel and sports publishers as well. Pixazza allows publishers to identify, tag and match products found within online images on their sites and then link them back to the inventories of Pixazza’s network of advertisers. The service, which can be integrated in a site by adding a single line of code, allows consumers to browse the photos featured on a site and mouse over it to reveal information and pricing about similar products, and if desired, click to purchase. Additionally, Pixazza shares advertising and affiliate revenues with publishers. 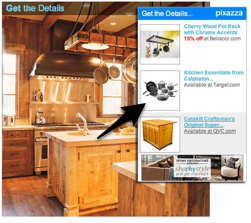 More than five million products are available through Pixazza’s service today from retailers and merchants. Pixazza’s technology launched last year with an inventory of listed products catered to entertainment and fashion blogs (Access Hollywood and OK Magazine use the product). And today, the startup is announcing that it has scaled its vast database of products to include images and tags related to the travel, home and sports industries. So, a home decor blog could implement Pixazza on its site. Pixazza’s tagging technology is also compelling; the startup crowdsources workers to list products and tag them with the appropriate link to a retailer. IPixazza’s web service currently serving 5 billion image views per year and seeing more than 19 million unique visitors a month, 70 percent of whom are in the U.S. And the startup says that its images are moused over 14 percent of the time on sites in which its technology is implemented. Pixazza caught the attention of newly launched Google Ventures last year; the startup raised $5.75 million from August Capital, CMEA Capital, and Google Ventures. Pixazza faces competition from Like.com, Image Space Media, GumGum and others.